Parents in New York state described the anxiety and depression experienced by their children after the state began implementing testing tied to the Common Core in part two of Home School Legal Defense Association's documentary, "Building the Machine: A Movie About the Common Core." The children are "blaming themselves and saying there is something defective with them and school is making them feel defective," Mary Calamia, a licensed clinical social worker who works with children and teachers in the New York state school system says in the film. "They're blaming themselves, they're saying they're at fault. They're calling themselves stupid. ... Thus we get anxiety and depression," she added. Rachel Gibson, a special education teacher and parent in Westchester County, New York, recalled that one child carved the word "stupid" into her wrist after receiving her test scores. Calamia recalled that around October 2012, after teachers had switched to the Common Core, she began noticing an unusually large number of students going to her with anxiety, depression and self-mutilating behavior. As a social worker, she had dealt with those issues before. What was unusual was the sheer number of new cases. "The numbers of kids coming in were off the charts, and that's when I first heard about Common Core," she said. 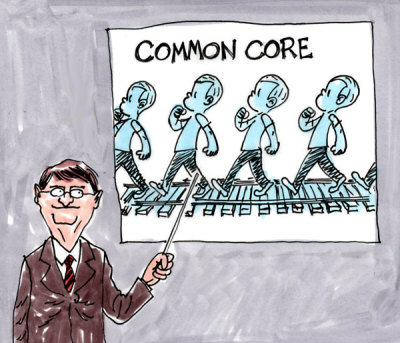 The Common Core curriculum is developmentally inappropriate, parents and experts in the film argued. Yvonne Gasperino, a parent in Westchester County, New York, could not understand why her children's school was adopting the Common Core, given that it is a private Catholic school. "This is cognitive child abuse," she said. Christine Tamke Barbara, a parent in Suffolk County, New York, was so confused about the mood and behavioral changes experienced by her son that she asked him if he was being molested. Part one of the documentary, released in April, features education experts, including two professors who were on the Common Core validation committee but refused to approve the standards. Experts who support the Common Core were also interviewed. The main message of "Building the Machine" is that Common Core treats children like little machines on an assembly line, rather than unique beings with different gifts and goals. In a Monday interview with Politico, Microsoft founder Bill Gates, who provided most of the funding for Common Core, substantiated this claim when he compared students to trains and electrical outlets. Part three of "Building the Machine" contains some supplementary episodes and is available on DVD. DVDs of all three parts are available for purchase at CommonCoreMovie.com. Analysis: Are Common Core Opponents Just a Bunch of Crazies?